SpaceEngineer, I have everything ready, but I did not understand, why I have two lines who cannot be translated. Where is the mistake? NEMESIS, upload your files and I will look at them. "Video capture without GUI" "Snimanje videa bez GUI"
"Video capture with GUI" "Snimanje videa sa GUI"
"Screenshot without GUI" "Slikanje bez GUI"
"Screenshot with GUI" "Slikanje sa GUI"
"Switch to fullscreen" "Prikaz preko cijelog ekrana"
I almost forgot, to translate stars which file should be edited? to translate stars which file should be edited? 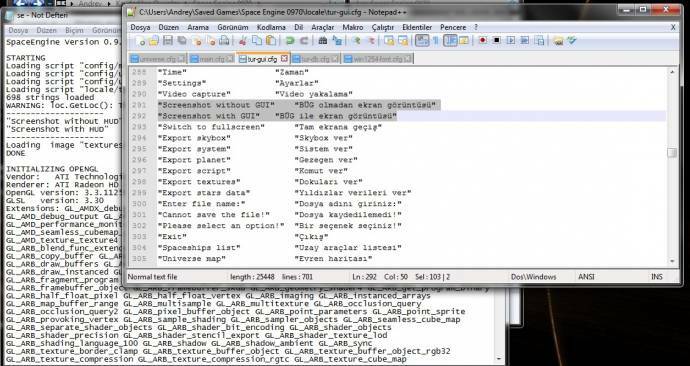 You need to edit the database file for your localization (tur-db.cfg). Look at the rus-db.cfg file for an example on translating star and planet names.